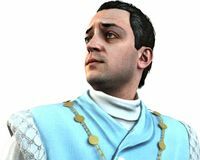 Possible picture of Cris Formage from GTA V.
Cris Formage is the founder and leader of the Epsilon Program, a cult based in the Grand Canaria, Cayman Islands. In 1992 he is interviewed by Lazlow on the West Coast Talk Radio show Entertaining America. On the show he denies that the Epislon Program is a cult, describing it as 'a fellowship of like-minded adults who tithe money in exchange for salvation and merit badges'. He also claims to have formed out of two eggs laid by twins on the day of the interview. He also has a rivalry with Darius Fontaine, calling him the devil. At the end of the interview, Lazlow describes Formage as an 'alcoholic turned self-deifying cultist'. In 2013, he's still leader of the Epsilon Program. Cris Formage is voice by Fred Melamed in GTA San Andreas. This page was last modified on 22 April 2014, at 19:06.